Someone you trust completely seems to turn on you. You survive, but your trust doesn’t. Suddenly, everyone looks self-serving and unreliable. You imagine enemies waiting to ambush you. I don’t suppose there’s anyone out there who hasn’t felt betrayed at one time or other. I can’t say I’ve ever been sure anyone was maliciously out to get me. Mostly, the hurts I’ve felt were clumsy misunderstandings—often on my part. I tend to put everyone on a pedestal, waiting for my hero or heroine to meet my expectations. A pedestal is not a natural setting. 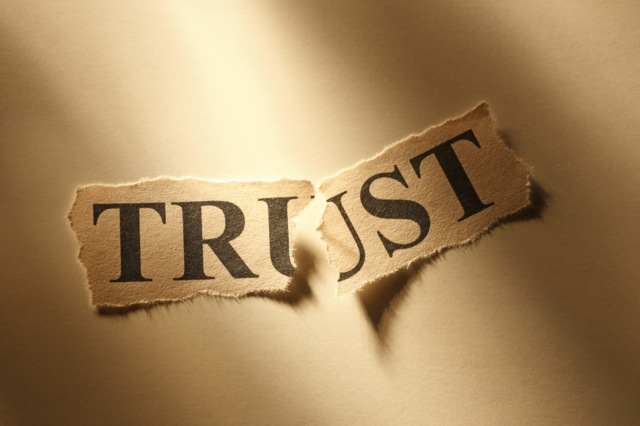 The worst case is when the person doing the “betraying” was someone close, someone you would’ve trusted with your life. That hurts. I know. But wait. Maybe there’s another side to this story. First, maybe there’s a lesson to be learned. Maybe you’ve been too dependent or been deceived by your own wishes. Research says women are better at spotting liars than men are—unless they love the liar. I had a student who refused to hear the truth about her boyfriend. He beat her up, and she still believed she had “asked for it.” Statistics say he’ll probably kill her one day. I say love everyone but don’t look away from the truth. When a situation seems to repeat itself, search for the lesson. Perhaps once you’ve conquered the lesson, the situation will stop recurring. Second, examine your view of yourself. You’re going to tend to see a world that reflects what you think of yourself. If you don’t like or respect yourself, Dr. Wayne Dyer would tell you that you’ll see contempt and plenty of reasons to be pessimistic around you. If you love and respect yourself, you’ll project that to those around you. Their negativity will fall to your feet unheeded like arrows made of soft sand. You’ll start to see only other struggling human beings instead of enemies. Once you lend empathy and help, you may even discover friends. Finally, the person mistreating you is probably expressing a darkness within him/herself—a darkness that may have absolutely nothing to do with you. People filled with self-hatred, insecurity, or fear often strike out—especially at those who won’t or can’t strike back. When the song says “You only hurt the ones you love,” there’s a reason. You can. Parents can dominate their children, spouses their partners, employers their employees, people from the majority against those in fewer numbers. They tell themselves they’re only doing what their roles demand they do. Once you understand, you might be able to help the attacker understand—or not. At least you’ll know it’s not about you. Speaking for myself, I’m working on trusting myself more, becoming oblivious to the opinions of those who surround me. Even thinking about doing that feels good. Personal responsibility and detachment is challenging for those of us whose behaviours were not formed by this thinking. Once the concept is understood, however, it does feel good, as you say. Another wonderful and thoughtful blog. Thank you. This entry was posted on September 19, 2015 by Personal Journeys with Gramma in Musings and tagged Betrayal, Broken Trust, Dr. Wayne Dyer, featured, Looking at the Truth, Musings, Personal Reflection, Seek Truth, Trust, Understanding.